Today was the full official launch of the Annual Meeting, with the official Plenary Session in the large Riviera Ballroom, featuring several notable speakers including NRC Commissioner Kristine Svinicki. APR was tweeting throughout the morning session, and I will not completely repeat the events here. Important events included receipt of an ANS Special Award to Margaret Harding, and an ANS Presidential Citation to Howard Shaffer III and Meredith Angwin. I have been in correspondence with Margaret and Meredith for some time now via e-mail and it was wonderful to meet them, as well as Howard, this week at this meeting. In the afternoon, I worked on some leads for stories either for ANS Nuclear Cafe or for Atomic Power Review (one lead might pan out, as you will see) and attended the ANS President's Special Session entitled "Low Level Radiation and its implications for Fukushima Recovery," as well as a technical panel session entitled "Solving the Spent Fuel Dilemma." Both were extremely informative and interesting. I will now satisfy a number of APR readers by taking a look at some of the sales and advertising materials offered in the many booths set up in the DD&R / ICAPP exhibit hall (DD&R stands for Decommissioning, Decontamination & Reutilization while ICAPP stands for International Congress on Advances in Nuclear Power Plants.) Many interesting displays are present in the exhibit hall area, and generally the materials offered are colorful and fairly informative. Generally speaking, large reactor technology is represented by Westinghouse (featuring their AP1000 PWR plant), by Mitsubishi (featuring their APWR and NRC compliant US-APWR plants), by the South Koreans with their consortium-built OPR-1000, by the Chinese with their offshoot branch of PWR plants based on the Westinghouse AP1000. The Westinghouse presentation is well set up, and its brochures clear and informative. There is not much to say about the Westinghouse AP1000 at this point as it is the clear leader in the US market, with four units under construction. The AP1000 is a 2-loop PWR rated 3415 MWt / 1110 MWe. The Mitsubishi display features an impressively large and detailed model of its US-APWR plant, which is its Japanese APWR design with modifications for US compliance. This plant is a very large 4-loop PWR rated roughly 4451 MWt, with net electrical ratings in the 1500 to 1700 MWe class. This plant uses a single, very large Model TC6F-54 4-cylinder, 6-flow exhaust turbine generator that has 54 inch final stage blades in the LP cylinders. The nation of South Korea is represented by KAERI, or the Korean Atomic Energy Research Institute. Their brochure is mainly interested in covering Korea's entire history in atomic energy; the standardized Korean OPR-1000, a 2-loop PWR in the 1000 MWe class, is only briefly mentioned. For the first time ever, the Chinese have a booth at an ANS meeting exhibit. 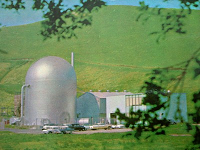 The State Nuclear Power Technology Corporation Ltd. brochure features the CAP1400 plant, which is a fully legally developed version of the Westinghouse AP1000. The CAP1400 is a 2-loop PWR rated 4040 MWt / 1400 MWe. The brochure more than once mentions the further development of a CAP1700 and while there are no details at all, only mentions, one would have to guess the core power of such a plant at roughly 4900 MWt. It is obvious that while the South Koreans are right abreast of the power rating offered presently for PWR's from Westinghouse, the Japanese and Chinese seem to favor a move to even larger plants. I should add though that with all of the uprates being completed at US plants the Chinese CAP1400 isn't significantly more powerful than the most powerful plants here in the US, whether PWR or BWR for that matter. The SMR field is of some interest. APR is following up on these stories, but it was noted at lunch today by Gwyneth Cravens (she, Dan Yurman and I had lunch together) that the Koreans were working on an SMR. This was not on our radar screen, as it were, so I went to the expo after lunch and spoke to the KAERI representatives. These men were only familiar with the large OPR1000 commercial plant and related information; the SMR, called "SMART" is an entirely different and isolated project. However, I came away with the e-mail address of the man in charge of the entire South Korean SMR program and will be presenting results of our correspondence here on APR. The brochure provided by KAERI indicates that the SMART SMR project was first launched in 1997. The core design was finished in 2002 and the 'conceptual design' of the SMART as a 330 MWt reactor plant was finished in 2007. The SMART SMR is intended for export, for power generation, power and heat delivery (steam), for water desalination, or a combination. The plant has a roughly 100 MWe output. The design life of the plant is 60 years, with a 3 year refueling cycle. The diagram appears to include canned rotor main coolant pumps totally inside the pressure vessel, along with integral steam generator and pressurizer. Mitsubishi indicates that it will also join the SMR field in the future. Research is underway to develop an Integrated Modular Light Water Reactor, with all components in the pressure vessel, but eliminating pressurizer (self-pressurizing plant) and reactor coolant pumps (cooling by natural circulation only.) No ratings are given, but a small conceptual drawing is shown. NuScale Power continues to advertise its 160 MWt / 45 MWe modular reactor, with placement of up to 12 modules in one plant to give up to 540 MWe. All parts can be shipped by barge, train or truck. This is a wrap on our brief coverage of the Expo; we've only touched the tip of the iceberg on displays by covering only power reactors but since this is APR's usual fare we'll end today's notes at this point. Watch our Twitter feed for much more tomorrow morning, starting very early! Many regular APR readers will recall the guest post made a while back by Meredith Angwin on the design, construction and testing of steam generators; this post is among the most popular ever on this site. Today, Meredith and I met and went for a long walk down Michigan Avenue, talking about many varied things and getting to know each other. I took dozens of photos; some will appear here on this site. Later on I met up with Dan Yurman, author of the well known Idaho Samizdat blog and from whom I took over moderating the ANS Social Media List. We caught up over coffee, and discussed a wide range of topics from highly technical material to politics and of course the progression of the upcoming events. I had the great fortune to meet Bonnifer Ballard today as well. Bonnifer has come to the ANS only recently, and is the ANS Director of Outreach. We had a long and very interesting conversation - wouldn't you know we're both Navy veterans! The rest of the afternoon was taken up with the Public Information Committee meeting which I sat in on as I was asked to make a short presentation concerning the ANS Nuclear Cafe blog post on spent fuel at Fukushima Daiichi which I wrote with the help of many others and even more who subjected the piece to two rounds of peer review. The cap for the day's official events was the President's Reception in the DD&R / ICAPP exhibit hall. The representation was great, the turnout great and the food and drink lavish. I had the great fortune to meet a large number of people (too numerous to list, and a list does no justice) and managed to cross off a large part of my "must meet" list. Tomorrow, keep an eye on the APR Twitter feed (that's "@atomicnews") for continuous reports from the Plenary Session, and other events. The hashtag for the annual meeting is #ans12. Today, I got on an airplane (which I have not done in over twenty years) and flew to Chicago for the American Nuclear Society's 2012 Annual Meeting. Here are some notes on today's experiences. The Hyatt Regency in downtown Chicago is a fantastic venue for the convention. The cavernous recesses under the West tower (the Hyatt has two towers, separated at ground level by a street but connected by sky bridge as well as street entrances) are seemingly more than large enough to hold the meetings; I only toured a small part of them with my ANS-issued Media credential in force. Almost immediately upon arrival I met Margaret Harding and her husband; Margaret needs no introduction to regular readers of pro-nuclear sites, blogs and Facebook pages. We later met up at the 151 Bistro in the East tower and had a great time getting to know each other a little. We agreed on just about everything and laughed a lot. Later on, after completing the check-in for the ANS Annual Meeting, I put my badge back on and went down under the West tower again to try to find Laura Scheele. As you may or may not know, I moderate the ANS Social Media List, and as moderator my direct supervisor is Laura, whose official title with ANS is Communications & Policy Manager. Being busy, she didn't have much time, but showed me to the Media Center where I also met Paul Bowersox. Paul conducts the day to day operations over at the fine ANS Nuclear Cafe website. We were just about to talk when in walks ANS President Eric Loewen, to whom I was introduced. Discussion was only brief at this point, because Mr. Loewen had to film a "welcome aboard" message, so I moved off to investigate more places that were open. I purchased a paper copy of the ANS Transactions for the meeting at the open registration desk. Operations at the check-in for the ANS meeting seem well organized and very efficient, as do operations at the walk-in attendee desk where onsite registration can be speeded by attendee use of provided laptops. The media package provided by ANS is first rate. (One must remember that I wear two hats here - while I am an ANS member, and moderate the ANS Social Media List I am also attending on a media credential from ANS and am reporting on the meeting; this is why I have the media package.) There are a number of informative brochures, including "The Greening of the Nuclear Age" which is very forward looking. However, I have to say that the most impressive thing ANS has done with the media kit is to include a stack of ANS Position Statements. These papers are simply brief explanations of the official ANS opinion, or Position, on various important and timely issues facing the nuclear industry and nuclear plant owner-operators today. These would be quite valuable to any reporter or any layman who really took the time to read them; they are each small masterpieces of brevity and clarity (even though some are multiple pages.) This addition to the media kit makes the entire kit worthwhile; let's hope that any of the wider media sources that get this package will really, honestly read these papers and get the most out of them. That's about it for today. Tomorrow promises many more chances to meet and get to know people, as well as a chance to see many (or all) of the displays that will be presented by many interested parties for this meeting. Much more tomorrow! Keep up with Atomic Power Review on Facebook, and on Twitter. APR tweets as @atomicnews and the official hash tag for the ANS Annual Meeting is #ans12. Atomic Power Review is proud to present the 110th edition of the Carnival of Nuclear Bloggers. This week's event comes immediately before a large number of us will be jetting off to Chicago for the American Nuclear Society's Annual Meeting (I will be there) and sort of kicks off what promises to be an active week of posting here on Atomic Power Review (as well as on the APR Facebook page, and the APR Twitter feed) since I will have a media credential (press pass) in Chicago for the event and will be reporting on it through these media. Since many folks who sincerely try to guess my "What is this?" feature pictures are pretty busy right now, I'm going to go easy on you all this week. This illustration should be guessed by more than a few. So... "What is this?" The answer to this question follows the 110th Carnival - which begins now! At Nuke Power Talk, Gail Marcus discusses Russia's accession to the OECD Nuclear Energy Agency. This is the culmination of a process that began several years ago when she was at the Agency and is an important step in assuring that the NEA's initiatives maintain a global perspective. Meredith Angwin reviews the book "Superfuel" at Yes Vermont Yankee. Superfuel, by Richard Martin, describes the history and promise of the liquid thorium reactor (LFTR). Angwin likes the LFTR and has even given a poster session on it. However, Superfuel is a difficult book to praise because of scientific errors and overly strong attacks on the the people ("nuclearati") who operated the current fleet of reactors. The Ukraine, India and the UK are on the verge of new nuclear energy investments.Ukraine could invest up to $25 billion by 2030 in the construction of new nuclear power facilities. India and France are close to signing a deal regarding to establishing India's largest Nuclear Power plant that will generate 9,900 Mega Watt (MW) of electricity. The prospect of new nuclear power stations being built in the UK for the first time in 20 years has moved a significant step forward after EDF Energy awarded a £2bn contract to build a plant at Hinkley Point in Somerset. Rolls-Royce confirmed it had won a Ministry of Defence contract worth more than £1bn (US$1.56 billion) to make reactor cores for Britain's nuclear submarine fleet. Though I have only made it through the introduction and part of the first chapter, I can tell that Superfuel will be providing fodder for several posts in the coming days. I can already tell that my effort is going to be focused at refocusing various factions within the fission family to look outward rather than to squabble internally. Though Martin has published a book that purportedly is pronuclear, I believe it is actually a well conceived effort to encourage fratricide that will support the hydrocarbon establishment. NEI Nuclear Notes has several submissions this week. NEI's Mark Flanagan takes a look at Japan's decision to restart the reactors at Ohi. NEI Victoria Barq looks at how states across the nation want to compete for federal dollars for SMR development. NEI's Mark Flanagan checks in on Germany's nuclear phase-out, and finds it isn't going well. "Cool Hand Nuke" makes an appearance in the Carnival this week with a post by Dan Yurman! Governors vie for DOE SMR Funds. regarding nuclear waste, spent nuclear fuel, and the Yucca Mountain site. they might mean - or not -- for US and other interested firms. A number of years ago, Uri Gat. an ORNL researcher, wrote a paper which argued that design features of the Molten Salt reactor made it the ultimately safe reactor. I reproduce and discuss Gat/s paper in Nuclear Green, in a post titled, Uri Gat, and the Ultimately Safe Reactor. That does it for this week's Carnival submissions. Since I'm going to have to get busy packing my suitcases for Chicago, I'll be very brief about the answer to the "What is this?" photo. 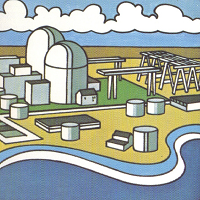 That illustration is a preliminary artists' conception of the layout of the Shippingport Atomic Power Station. Of course, the finished plant was not laid out this way and looked quite different - but the concept of the underground siting of the primary plant components was retained. This illustration is from the Westinghouse brochure titled "They Harnessed the Atom," published by Westinghouse Electric Corporation's Information Services Department in September, 1954 - which is very shortly after the project was launched. Of course, the project wasn't entirely new; the Shippingport plant was a development of the cancelled Navy CVR plant. What was new was the approach to containment, with reactor, steam generators and pressurizer (and a good deal of other equipment) contained below grade. Next time I post on APR it will be from Chicago! Southern California Edison has provided the following press release, direct to Atomic Power Review, concerning this evening's public NRC meeting at 6 PM Pacific. ROSEMEAD, Calif., June 18, 2012 — Southern California Edison (SCE) will be participating in the Nuclear Regulatory Commission (NRC) public meeting today, Monday, June 18, in San Juan Capistrano. The NRC will present findings from its Augmented Inspection Team (AIT) that visited the San Onofre Nuclear Generating Station (SONGS) earlier this year. SCE has not received the NRC’s report from the AIT and cannot comment on its content at this time. The utility will be presenting information to the NRC and the public on the ongoing steam generator tube wear analysis and responding to questions from the NRC at the public meeting. SCE’s number one priority is, and has been, the health and safety of the public and its employees. SCE will not restart the SONGS units until the utility and the NRC are satisfied that it is safe to do so. SCE will not be discussing restart at the June 18 meeting as that is not within the scope of the AIT report. Currently, SCE estimates that SONGS Unit 2 likely will remain off line through August. A plan for Unit 3 is expected to take longer to develop. Unit 2 was taken out of service Jan. 9 for a planned outage. Unit 3 was safely taken off line Jan. 31 after station operators detected a leak in a steam generator tube. Southern California Edison has also provided us with a copy of a special fact sheet which has been distributed to interested parties; this fact sheet gives some quick background on steam generator replacement. Click here to access this fact sheet on the SONGS update page. Jennifer Manfre has also provided a copy of the relevant pages of the Federal Register in which are covered the NRC findings on the San Onofre steam generator replacement. It is clear that the NRC staff found "no significant hazards." Given the history of steam generator replacements prior to those performed at San Onofre, data this author has read on Inconel 690, the SoCal Ed referenced material and professional opinions, there is no specific or pointed reason known or given at this time to think that anyone - SoCal Ed, Mitsubishi, the NRC or anyone else - should have suspected problems due to vibration in these steam generators such that tube damage would occur. Reports today in the general press are indeed focusing on design issues with the steam generators, apparently in an advance release of NRC investigation findings. Much more work remains to determine the root cause of this problem. It is unknown to this author why NRC AIT findings would be released and / or discussed in an Associated Press wire story prior to the findings being supplied to Southern California Edison. SoCal Ed will be taping the meeting and may post some of the video; if this happens, I'll note that on this site. The news on the wires this morning is that the NRC feels that computer modeling performed by Mitsubishi in determining flow and heat transfer characteristics internal to the generators was flawed. This seems to drop the problem squarely in Mitsubishi's lap, but there is by no means a certain outcome for this yet - in fact, whether or not Mitsubishi is finally found at fault, Southern California Edison could well still be fined. The situation is still highly unclear, although we're a step along in determining the real cause. As Meredith Angwin pointed out in her very popular guest post on steam generators, it would appear (in my opinion as well) that operation at reduced power should be possible with greatly reduced likelihood of damage. This will probably shake out as the operational testing period plan. The 109th Carnival of Nuclear Bloggers is up right now over at the ANS Nuclear Cafe. Click here to access Carnival 109. Make sure to check this one out! Background: A number of us have been discussing, for some months now, the chance that some of the water leakage at the Fukushima Daiichi plants which experienced the meltdowns might be completely external to the reactor vessels, and might be due to the deleterious effects of water hammer (sometimes in the old days known as 'steam hammer' under variable conditions.) This happens when a dead end of pipe, or piping with a restriction or perhaps a check valve is suddenly pressurized; water, being for all practical purposes totally incompressible, can cause serious damage when it is propelled suddenly with high velocity to the end of a piping run which effectively is dead headed. It has been postulated that this kind of effect, perhaps in conjunction with thermal shock (the operators did have to resort to the use of any water volume available, including sea water) could have resulted in leakage that detracted from flow that should have been cooling reactor fuel at any or all of the three plants that experienced core melting. While this is merely conjecture, I will add that is is sensible and informed conjecture - but also conjecture that can't be proven until TEPCO can get far deeper into the plants than it is now. What follows is a very interesting reflection on this phenomenon by A. David Rossin. "Dave" Rossin has become one of my e-mail acquaintances (who I cannot wait to meet in person) through the American Nuclear Society; Dave is in fact a past ANS President. His experience is incredible and quite varied, and a proper bio would be a half hour or hour long TV documentary. I'm proud to present his piece below in entirety and unedited. A couple of years after I started work at Argonne in 1955 I was assigned to the ALPR project. This was the small 3 Mw thermal BWR which was designed to be for a remote Alaskan DEW Line outpost. It was later renamed SL-1. Remember? I was “Assistant Reactor Physicist.” After we had run it for a couple of months, we scheduled a set of tests to verify its safety and to test the performance of some safety systems. The ALPR had a spray ring inside the vessel above the top of the core. Its purpose was to provide emergency cooling water to cool the core if it was necessary to quench the steam, depressurize the vessel and flood the core. In some ways it was the forerunner of the HPCI, the high-pressure injection system of the first BWR’s. I was in the control room, which was separated from the reactor building by a gap, some steel and12 feet of rock and sand shielding. The plan was for the operator was to SCRAM the reactor, slow down and then cut off the recirc pump, let boiling subside, and then activate the emergency spray cooling system. Several seconds after the pump was turned on the banging started. The noise level was terrible! The control room shook violently, and we figured that the reactor and its structure did too. The emergency pump was cut off ASAP. The heaviest banging soon stopped but a lower level of noises kept up for a while. I recall that an “older” engineer (he must have been 53 or 54) announced that it must have been “steam hammer.” He told some of his boiler stories, and we all recalled visits to our parents or grandparents’ apartments in the winter when the radiators had gone on and there were couple of minutes of steam hammer before things settled down and they got hot. Heavy cast-iron radiators seemed to sit just below windowsills. “Steam Hammer”, “Water Hammer” - the two names were both used. What was obvious was that when water was injected by the emergency pump into the spray ring, the ring pipe was plenty hot, and before high-pressure water flow could be established into the ring and out the many holes, water would flash to steam at many places and the banging was the result. Much later, when the ring itself was examined, damage was found on the supports that held the ring onto the inside wall of the pressure vessel. But as I faintly recall, the ring itself, though kind of discolored, was pretty much as it had been dimensionally. No new cracks or bends. We decided that the emergency cooling function had to be re-evaluated. 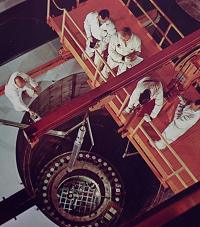 Meanwhile the reactor would only be operated at very low power for physics measurements and training purposes. I went back to Chicago and was assigned to work with Bernie Spinrad as his Reactor Physics Division Assistant Director, Monthly Report Editor and Errand Boy, etc. It was a couple of years later, serving on the Argonne Reactor Safety Review Committee that the water hammer issue came up again somewhere else. By then, ALPR had been transferred to Combustion Engineering to operate for the Government and named SL-1. To the best of my knowledge, no operator had tried to operate the emergency core cooling system. I believe it had been locked out. It had nothing to do with the later tragedy that killed three men and ended the life of SL-1. When I was at Commonwealth Edison after 1972 I visited Dresden and Quad Cities. I talked at length with the plant managers. One of them set up a meeting for me with guys from GE. They explained how they had engineered their HPSI and LPSI systems to avoid steam/water hammer, and provided papers on a couple of test programs. Although the issue was looked at again at NSAC while the Peach Bottom PRA was being done, the guys there found it satisfactory and it did not run high in any of their risks analyses. Every couple of years I get a dream about water hammer. I think about conditions at the time it is needed being outside the envelope of temperature, pressure and flow conditions for which its operation was designed and tested. I just hope I never wake up to find myself reading about it in the paper the next morning. Thanks to Dave Rossin for this story - which gives our readers here a first person introduction to this phenomenon; we may need this for background as the Fukushima Daiichi investigations continue. Below, from "Boiling Water Reactors" published for the AEC in 1958 (by Andrew W. Kramer), we see the ALPR (later, SL-1) site. 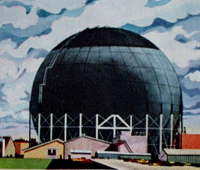 The largest cylindrical structure in the illustration is the reactor building, which housed not only the reactor but the turbine generator as well. The control room was located in the adjacent support building. Review: "Super-Fuel: Thorium, the Green Energy Source for the Future"
When I first received my copy of Richard Martin's book "Super-Fuel: Thorium, the Green Energy Source for the Future," I was thinking to myself "Well, this is going to be just fabulous. Here we go with another loony story about alternative reactor designs - we all know that LWR plants (Light Water Reactor) are the only ones that made it, and everything else went by the wayside .. so why bother any more?" I also thought about some reading I'd done when I was researching the article I did on this website about Elk River. That reactor, a unique indirect-cycle BWR plant, initially had thorium in its fuel (as did Indian Point 1, and a couple of other plants, too) but the program was abandoned almost as quickly as it started. Another volume in my library called "Minerals for Atomic Energy" which I consulted during the project relates the extreme difficulty in extracting thorium from monazite deposits - making it fairly uneconomical. Thorium never again figured in LWR plant operation, or any serious mainstream economic considerations about the nuclear fuel cycle, past the 60's. So, I thought, as I began to read the book, that I was about to be really unimpressed by a wild narrative of impossible designs and people all too willing to believe the unbelievable. I was wrong by quite a long shot. Immediately upon starting the book I was presented with a brief narrative of a hike to the site where the Clinch River Breeder Reactor construction began but which never got too far. This project in some ways represents one of a number of killed-off "should have beens" of the history of nuclear energy as it was envisioned when it became mature. We were supposed to have breeder reactors making more fuel than they produced; we were supposed to have a complete nuclear fuel cycle that included reprocessing, and a fully operational national high-level waste repository. We were supposed to have gas cooled reactors that could develop, without external (fossil fired) superheat, 1000F steam. We were supposed to have a wide array of nuclear plant designs and outputs, placed all over the nation in outputs from just a few megawatts to 1500 and more.. and we were supposed to have combined power generating and water desalination plants to solve irrigation and drought problems out West (and in Mexico.) Most of this never came to pass, thanks largely to environmentalism and to economics. But the Clinch River project does represent one of those great "should have beens".. and that is why an illustration of it leads Atomic Power Review. At that point, Richard Martin had my attention. All too often, we see the end of a project as the end of a concept. The people working today on LFTR technology do not. The book does of course go on to describe, in very thorough and satisfying detail, the operative cycle of LFTR plants and how they differ from LWR plants. It does go on to describe the developmental history of this kind of plant, as well as the background of some of the major players in the nuclear energy industry (both of yesterday and today) who have backed, and are backing this project. For just this, the book is useful and is commendable. However, perhaps more startlingly (and pleasantly surprising) the author chooses to include what amounts to a capsulized history of nuclear energy in the U.S. and does so in a very interesting and very humanistic way. I especially enjoyed this unexpected inclusion .. and for just this, the book is very worth purchasing. I do have some nitpicks with the book. The author's bias toward the LFTR concept is clear, and LWR plants are of course denigrated to an effect supportive of the author's concepts. There are a few assertions with which I might take exception, but perhaps these are errors (if they are indeed errors) borne of enthusiasm. As such, I do suppose they're tolerable. If one wishes to get a grip (but not a super quick read, for this book is not that) on where the LFTR concept is right now, and some of the background behind its present push for commercial construction, this book should be added. For those keeping complete libraries on presently published works, it must be added, as it must for those interested in that myriad of alternative fuel and coolant technologies long since gone by the wayside in nuclear energy. There are some especially good insights on Hyman Rickover in the book; the chapter about Rickover and Alvin Weinberg (co-author of my all-time favorite book "The Second Nuclear Era") is a truly fascinating and riveting story of these men and early nuclear energy history. Although not specifically focused on LFTR concepts per se, this chapter is that which I enjoyed the most. I really appreciate having been provided a copy of the book, and believe it makes a worthy addition to my library. In fact, I believe it to be a decent tool (if only it had a complete index!) for reference when I encounter, as increasingly I will, questions or issues about this technology on my site. Good show, Mr. Martin! Following is a press release from Westinghouse direct to APR. PITTSBURGH, June 13, 2012 /PRNewswire/ -- Westinghouse Electric Company LLC and Nuclear Power Company of India Limited today signed a Memorandum of Understanding (MOU) agreeing to negotiate an Early Works Agreement (EWA) supporting future construction of AP1000® nuclear power plants at the Mithivirdi site in Gujarat. The agreement represents significant progress toward the realization of the India – U.S. Civil Nuclear Agreement signed in 2008. The Early Works Agreement will include preliminary licensing and site development work. "This agreement is an important step which will allow Westinghouse and NPCIL to continue the work necessary for keeping the Mithivirdi project moving forward," said Gary Urquhart, vice president and managing director of Westinghouse India. The Westinghouse AP1000® nuclear power plant is licensed in both the U.S. and China, and is recognized as the safest, most advanced Generation III+ design. Rather than relying on active components such as diesel generators and pumps, the AP1000® relies on the natural forces of gravity, natural circulation, and compressed gases to keep the core and containment from overheating. Even with no operator action and a complete loss of all on-site and off-site AC power, the AP1000® will safely shut down and remain cool for seven days without the need for auxiliary water supply. Below is a direct press release from NuStart Energy Development LLC. WASHINGTON, D.C. (June 12, 2012) – After achieving its goal of licensing the first new nuclear power plants in decades and spurring more than $2 billion in private investment in new nuclear energy development, NuStart Energy Development, LLC will disband and reallocate its resources back to its 10-member companies effective June 30, 2012. When NuStart Energy Development, LLC was formed in 2004 with the goal of helping to lay the foundation for the next generation of nuclear plants in the United States, the 10-utility-members outlined two objectives. The first objective was to obtain a Construction and Operating License (COL) from the U.S. Nuclear Regulatory Commission (NRC) using previously never been tested licensing process developed in 1992; the second was to complete the design engineering for the Westinghouse AP1000® technology. Both objectives were achieved in the past six months: the AP1000 reactor was approved in December 2011 and the NRC issued the COL to Southern Company subsidiary Georgia Power’s Plant Vogtle in February. Part of the Department of Energy’s Nuclear Power 2010 initiative, NuStart was funded by what was designed to be a 50-50 cost-shared program between the nuclear industry and the DOE. DOE funding for nuclear energy amounted to approximately $355 million. Together with Westinghouse, NuStart’s contributions amounted to approximately $975 million. For approximately every $24,000 the government spent, one new stable, high-paying manufacturing or technical services job was created, according to the estimated return on investment for federal dollars. With its mission achieved, NuStart member utilities will concentrate resources on the companies’ respective nuclear projects, after the group disbands on June 30, 2012. Providing approximately 60 percent of the electricity generated by nuclear power in the United States , the member utilities of NuStart Energy Development, LLC actively pursue diverse portfolios of generation options to meet their customers’ power needs safely, reliably and efficiently. NuStart members have worked together to demonstrate the nation’s licensing process and completed designs for the first advanced nuclear power reactors in the U.S. in nearly 30 years. DTE Energy, Detroit, Mich.; Duke Energy, Charlotte, N.C.; EDF Inc., Chevy Chase, Md. ; Entergy Nuclear, Jackson, Miss. ; Exelon Generation, Kennett Square, Pa.; Florida Power & Light Company, Juno Beach, Fla.; Progress Energy, Raleigh, N.C.; South Carolina Electric & Gas, Columbia, S.C.; Southern Nuclear, Birmingham, Ala.; Tennessee Valley Authority, Knoxville, Tenn. This week's events and discussion with industry insiders have together led to the paper I present below. I welcome comments on this and would prefer that serious or interested commenters use the e-mail address provided on the right sidebar of Atomic Power Review. The D.C. District Court of Appeals' decision to throw out the NRC's Waste Confidence Rule, along with other recent decisions, has again placed the issue of long-term storage of High-Level Waste (HLW) squarely in the American focus. Spent nuclear fuel - a major contributor to the total volume of HLW extant - has further been in the public eye as a result of a number of media stories concerning spent fuel in storage at the Fukushima Daiichi nuclear station in Japan, particularly as regards the safety of the spent fuel at that site. While many dire predictions have been made about effects on the fuel by various mechanisms and resulting environmental consequences, all have been addressed prior to now in the extant literature; further, the site operator and the Japanese government (through its regulatory bodies) are continuing to both assure the public of the safety of the fuel, and perform continuing assessment of the fuel condition and structural integrity of all buildings on site. Even so, safety of spent fuel is on the public opinion radar screen, and now that it is, we find ourselves at a juncture in the United States where the extant Waste Confidence Rule has been thrown out, threatening the existing "as-is, where-is" condition for spent nuclear fuel. The federal mandate to provide a permanent, safe, federally funded HLW storage facility has never been taken off the books, although the NRC recently halted its study on the use of a facility partly constructed at Yucca Mountain, Nevada, as the national HLW facility. This places the program in a unique condition, since at this moment the study is halted, no alternative site has been identified, and the District Court has indicated in its decision that the NRC's assessment of spent fuel "as-is, where-is" is inadequate in terms of safety analysis. Statements by individuals familiar with the industry, as well as an official statement by the Nuclear Energy Institute, seem confident that the NRC will quickly be permitted to reissue its Waste Confidence Rule which will occur only after safety of spent fuel "as-is, where-is" is reassured by presentation of further evidence from the literature, or by new studies. Assuming that is the case, spent fuel will remain on the sites of nuclear generating stations as it is now (both in water filled Spent Fuel Pools when still very "hot" in terms of heat, and also in radiological terms as well as in Dry Cask Storage, out of doors but securely on site.) What will then have changed, however, is that the NRC will have been mandated to finish its study of Yucca Mountain (funding to the tune of $10 million extra has been approved by the House, relieving the NRC of any excuse that funding is an issue) and regardless of the adequacy of that site, the federally mandated storage for spent nuclear fuel off the site of nuclear plant owner-operators will finally have to be completed. Many insiders feel that the Yucca Mountain site, for all of this, will prove inadequate and in fact unsatisfactory - not for reasons of space, but for geological reasons (primarily, water intrusion.) Should this be the case, the DOE (Department of Energy, responsible to build the storage) will be left essentially at "square one" in terms of a location for storage of the nation's spent nuclear fuel and other HLW material. 1. Shipment of HLW to the DRS locations would be easier logistically than shipment nationwide to a single large site, and less expensive. 2. Storage of HLW out of doors, but under cover in Dry Cask type storage would allow for easy access for inspection, easier movement, and cooling ultimately by air. Such facilities' siting could be considered differently from that for power reactors, since the release due to accident is both far less likely, and far less concentrated. Many possible sites already exist, in fact, having been cleared and licensed for nuclear generating stations that were never completed or never built. Any or all of those sites whose construction cancellation was due to reasons other than geologic or environmental could be considered, again, for use as a DRS for this program. Further, many other sites could be located. A further advantage of this kind of program is that it could be expanded as needed as spent fuel inventory grows. A gigantic underground site such as Yucca Mountain has, by nature, essentially a fixed upper volume limit; with the licensing process for a DFRP using multiple DRS locations the acquisition of added space for storage would in fact be far easier. Many other considerations would need to be made for such a program, but the DFRP concept has enough merit now, faced with the need for permanent repository for spent fuel and the likely inadequacy of Yucca Mountain, that this old idea should be given a fresh examination. Recently, I wrote an article with help from many other people which was presented on the ANS Nuclear Cafe in order to refute misinformation about the safety of spent fuel at Fukushima Daiichi. There was some material that did not make the final edit, for space as well as focus related reasons. Ted DelGaizo submitted a piece which was in response to statements by Mr. Markey and others on 'loss of containment' of spent fuel pools. With the very recent news this week surrounding spent fuel safety on nuclear plant sites, and the future of a spent fuel repository, I think it is important that his piece get published now. Below is the piece Ted submitted in its entirety; following the piece is a short bio. In a potential reactor accident, radioactive materials must be contained and release to the environment must be prevented. The reactor containment is designed for this purpose. In a spent fuel pool with a loss of cooling, the ultimate fuel-cooling is through the mechanism of pool boiling. The boiling pool steam is not contained but is released to the atmosphere. Hence, the concept of containment does not apply to spent fuel pool cooling other than indirectly by maintaining fuel integrity through pool boiling. The reactor plants that comprise the current fleet of nuclear-electric generating plants in the USA are primarily pressurized water reactors or boiling water reactors. In either case, the reactor core is cooled by tens of thousands of gallons of water at temperatures typically at 500°F and above. In the unlikely event of a cooling-system piping-rupture, the water would be released to the surrounding (containment) building and would immediately flash to steam because the containment building is initially at or near atmospheric pressure. The large volume of steam would pressurize the containment building above atmospheric pressure, typically to pressures in the vicinity of 30 to 50 pounds per square inch (gauge pressure). Since the containment building would become pressurized in the loss-of-coolant accident postulated above, the containment must be capable of withstanding these pressures in order to preclude escape (to the outside environment) of the steam and any entrained radioactive gasses, particles, and other radioactive materials that would also be released to the containment atmosphere. Consequently, reactor containment buildings are generally constructed of several foot-thick concrete walls with reinforcing steel bars and with stainless-steel liners to completely contain the internal atmosphere. These large and extremely strong buildings also protect the reactor and other internal equipment from external hazards such as tornadoes, hurricanes, and even aircraft impacts. The reactor building at the Chernobyl plant outside Kiev in the Ukraine was not constructed with this USA-style containment building and consequently substantial levels of radioactive materials escaped into the outside environment following the accident there in 1986. Reactor containments are not needed for spent fuel pools. Spent fuel pools are large swimming-pool type structures open to atmospheric pressure. The pools are typically 35 to 40 feet deep, with the spent fuel sitting in steel racks at the bottom of the pools and a minimum of about 25 feet of water sitting above the top of the fuel racks. The water is essentially clean and contains some minimal radioactive contamination that leaches from the fuel but is constantly being filtered and purified by a filtration and cooling system. If the forced cooling system fails and cannot be reestablished for a sustained time period (e.g. due to a total loss of electric power as occurred at Fukushima), the pool will slowly heat to 212°F and will eventually boil. A boiling pool is a safe pool from a nuclear or radioactive standpoint as long as the pool water that evaporates or boils from the surface is replaced such that the boiling (which is removing heat from the fuel) can continue indefinitely or until forced cooling is reestablished. Boiling rates would typically require less than 100 gallons per minute of replacement water that can normally be supplied from a variety of sources including gravity flow from make-up tanks or via make up pumps that can be supplied by diesel-engine driven pumps (such as fire-water pumps or fire trucks) even when site electrical power remains unavailable. While spent fuel pools normally sit in buildings, the buildings themselves are unnecessary in order to capture or retain the boiling steam because the steam must be vented into the outside atmosphere in any case. Steam from a spent fuel pool may contain some minimal level of radioactive contamination that will be so low as to be essentially undetectable by current monitoring equipment and would pose no threat to the general public. There are no comparisons between the steam released from a boiling spent fuel pool and the radioactive materials (fission gases and other highly radioactive materials) that would be found in the atmosphere of a reactor containment building following a major loss-of-coolant accident. They are orders of magnitude different and should not in any way be considered as equivalent from a radiological or other hazard standpoint. Hence, comparisons of containments for reactors and containments for spent fuel pools are equally illegitimate. Mr. DelGaizo is a 1963 graduate of the US Naval Academy and has over forty-five years of experience in nuclear-power engineering, including plant operations, design, licensing, modification, and quality assurance. He has been a technical consultant to the USNRC and a consultant to senior nuclear utility management. 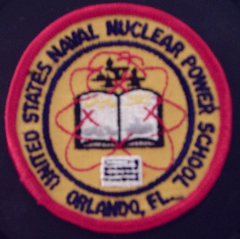 Highlights of his professional career include nuclear plant operation as a US Navy submarine officer including duty as chief engineer officer and submarine executive officer; nuclear-mechanical design-engineer with a major architect-engineer firm; and an emergency response team member at Three Mile Island Unit 2 following the 1979 reactor accident. Last Thursday, APR ran an article (click here) on actions that indicate a real future for a national spent fuel repository; the House guaranteed $10 million for continuation of the Yucca Mountain study by the NRC, and the DOE was rebuked by a Federal Court of Appeals for continuing to charge utility companies money for deposition in the spent fuel fund when there isn't any working plan to develop a national repository. Yesterday, the future of the spent fuel repository - wherever it ends up, and whenever it gets built - seemed to have another positive contribution when the D.C. Court of Appeals threw out the NRC's "Waste Confidence Decision." "This is another in the growing line of cases involving the federal government’s failure to establish a permanent repository for civilian nuclear waste." Below, the Nuclear Energy Institute's press release on this latest court decision. WASHINGTON, D.C.—The Nuclear Energy Institute’s Ellen C. Ginsberg, vice president and general counsel, made the following remarks in reaction to the U.S. Court of Appeals for the D.C. Circuit ruling today to vacate and remand the Nuclear Regulatory Commission’s waste confidence decision. “We are disappointed by the court’s decision as we believe that the NRC supported its conclusions in the waste confidence decision. Nonetheless, we urge the commission to act expeditiously to undertake the additional environmental analysis identified by the court in the remand. We also encourage the agency to reissue the rule as soon as possible. What essentially has happened here is that the D.C. Court has come to believe that spent fuel in dry cask storage, and in spent fuel pools, is dangerous. In fact, in the decision, the Court -- which has no nuclear engineering experience whatsoever -- mentions the possibility of spent fuel pool fires as one possible event that needs more examination. Quite recently, a piece that was presented at the ANS Nuclear Cafe totally demolished the concept of spent fuel pool fires at the Fukushima Daiichi plant, in large part because of the age of the fuel involved and the total coverage of many multiple layers of backup power and equipment on site, near the site and transportable to the site. (Structural integrity of the buildings was also another issue, clearly addressed. This piece was produced in response to ridiculous and hyperbolic claims being made in anti-nuclear circles about the situation at the Fukushima Daiichi site. NUREG / CR-4982 "Severe Accidents in Spent Fuel Pools in support of Generic Safety Issue 82." This document, bearing a NUREG identifier, is clearly a Nuclear Regulatory Commission document. This document dates from mid-1987. This is by no means the only document ever produced on the subject. Even the simplest examination of the document, namely its title and publication date indicates that the NRC has been considering spent fuel conditions at existing plants for twenty-five years at least, and has considered worst-case scenarios (even though their likelihood is negligible in the case of spent fuel storage in the U.S.) There is much more work on the subject that can be found, but the point is that the NRC did in fact have good ground to stand on in saying that spent fuel is safe where it is now, as it is now. The problem is that we will still eventually run out of room for it - and the utilities will still probably be paying the DOE whether a national facility is built rapidly or slowly. Chairman Jaczko, then, was probably completely correct in his various statements that spent fuel can reside where it is for quite a few more years yet; it appears as if the Court thinks that this was an uninformed and all too convenient assumption. What the Court is not aware of, apparently, is decades of work on spent fuel safety and what the real situation concerning spent fuel at varied U.S. plants really is. With luck, this will all be reasserted as the NRC works to reissue the Waste Confidence Rule. Below is a press release direct to APR courtesy Southern California Edison. News out of Washington today is most promising for those of us who have been seriously concerned about the issue of long term storage of high-level waste (spent nuclear fuel) in the United States, as the DOE has been found to have no basis for continuing to charge utilities for payments into the Nuclear Waste Fund (since the NRC Chairman killed the Yucca Mountain fuel repository program review process); in a different move, a fair injection of further cash has been made to fund the full completion of the Yucca Mountain study by the NRC so that there is no chance of the resurfacing of the Chairman's claim that funding was an issue. It should be kept in mind when reading the above fact that the Federal Government is and has been for many years legally obligated to provide such a long term storage facility, in order to get HLW off the sites of owner-operators (i.e. the nuclear power plant sites themselves) and has totally failed in this obligation. Jaczko's killing of the project study is thus especially troubling in light of the fact that no alternative was prepared, or even suggested." In Jaczko's eyes, and in Reid's eyes, this probably should have been the end of this. But there have been some serious reversals in the last week. Let's look at two of the Nuclear Energy Institute's press releases on the matters at hand, from which we can obtain full and clear detail. “The court is unequivocal in finding DOE’s interpretation of its legal obligation ‘unacceptable’ and rejecting DOE’s use of Yucca Mountain costs as a ‘proxy’ when the agency terminated the program. The industry’s priority continues to be realization of a fully functioning used fuel management program at DOE. “Significantly, the court said that the plain language of the statute ‘utterly destroy[s] the Secretary’s claim that he can remain entirely passive and only act to meet DOE’s legal commitment if some [god from above] were to bring him information.’ The court highlighted DOE’s failure to provide an accurate estimate of the ultimate cost of the program, saying the government’s calculation ‘appears to be off by $30 billion.’ The agency must provide clear justification to continue to collect the Nuclear Waste Fund fee at the present level. The Nuclear Energy Institute is the nuclear energy industry’s policy organization. This news release and additional information about nuclear energy are available at www.nei.org. To summarize the above, it's important to understand that the Court of Appeals knows that the Yucca Mountain project has been halted by Chairman Jaczko, and thus the DOE cannot continue to charge US utility companies that own and operate nuclear power plants for a spent fuel repository program that DOES NOT EXIST. Of course, the major problem with the above statement I've just made is that the program actually DOES exist - it's legislated, and has been for decades. That's right! As I've mentioned so many times before, the government is obligated to locate a site for, and to build and operate, a national nuclear waste storage facility. This was to be at Yucca Mountain; when Jaczko killed the study, it was thought that he killed the program. Of course, he can't do that because he has no legal authority to do so; his business, if you will, is regulatory oversight of the nuclear energy industry. He's not the legislative branch of the government - although his statements during one or more press conferences DO indicate that he feels that as NRC Chairman he does have appellate authority over submissions and studies made to the NRC. The NRC is obligated to fully complete the Yucca Mountain study. And now, there will apparently be plenty of cash on hand to ensure that this is possible. Let's look at the second Nuclear Energy Institute press release we'll see today. WASHINGTON, D.C.—The Nuclear Energy Institute’s Alex Flint, senior vice president for governmental affairs, made the following remarks in reaction to the House of Representatives’ passage today of an amendment to the fiscal 2013 Energy and Water Development Appropriations Act. The amendment will increase funding by $10 million for the U.S. Nuclear Regulatory Commission’s review of the license application for a repository for used nuclear fuel at Yucca Mountain, Nev.
“The nuclear energy industry applauds action taken today by the House of Representatives to increase funding for the independent Nuclear Regulatory Commission’s review of the Department of Energy’s license application to build a disposal facility for used nuclear fuel at Yucca Mountain. Congressman Shimkus’ leadership in this area has been central to Congress’ effort to spur the development of a disposal facility that will safely and securely manage nuclear fuel from commercial and defense applications. For detailed news on this action I highly suggest reading this link, which is at The Hill. -The NRC has an obligation to complete the Yucca Mountain HLW facility study. -The NRC Chairman does not have authority to suspend the Yucca Mountain study. -The DOE cannot continue to charge utilities for a spent fuel disposal program that (at least temporarily) does not exist. -If the DOE wishes to continue to collect money for the Nuclear Waste Fund it must follow the letter of the law and get the national repository for HLW studied, built and operational somewhere, even if it is not at Yucca Mountain. This amounts essentially to a whirlwind turnaround from where we were when the announcement was made that the Yucca Mountain study was terminated by Chairman Jaczko. If events continue along these lines, the nuclear renaissance can look toward a stable future for spent fuel and not worry about whether or not the DOE and the Federal Government will finally meet their legal obligations.